Soft top Wrangler covers are great for long, sunny days, yet when the cold comes it is time to look for at a hard top. A good hard top will provide a solid seal and keep the cold outside. It will also keep out moisture build up and hold up to extremely cold conditions. When getting out your factory hardtop or buying a new one, you will want to make sure to check it for cracks in the seal and/or other damage. These cracks will let in the cold air or moisture from the snow. This will cause you to run the heater for longer periods of time causing you fuel economy and additional wear and tear. Many times, you can visit your local Jeep dealer or hardware store for weather stripping to replace old cracked and weathered strips. Whether you buy a new hard top or use an old one, just make sure you carefully inspect it. Taking this time will pay off down the road. When people talk about winter driving, they talk about two things: winter driving skills and tires. Quite often, though, these two things go hand in hand. For example, a good winter driving tip is to allow more time to stop on snow or ice. This is great if your tires have grip. If they are old and bald, you will slide no matter how careful you are. In certain parts of the country, snow tires with thicker tread or studded tires make a lot of sense. These tires provide additional grip when stopping and accelerating. This helps keep you and your passengers safe. Adding a grille guard to your Jeep Wrangler is a smart idea for all sorts of reasons. A big reason is for winter driving. The fact is you will slip and slide at some point while driving your Jeep. It could be a minor slide or you could do a 360 degree circle. In either case having a grille guard on the front will protect your Jeep from taking front-end damage. It will also help provide an additional layer of metal if you have a head-on collision. Simply put, grille guards are an inexpensive way to protect your expensive Jeep. When was the last time you engaged 4wd? Don’t know? It is time to have it checked. With winter weather, there will be times you will need to engage 4wd including the seldom used 4wd low. If you don’t engage these systems very often, the components can lock up over time. While this is rare in newer Jeeps, it can still happen. 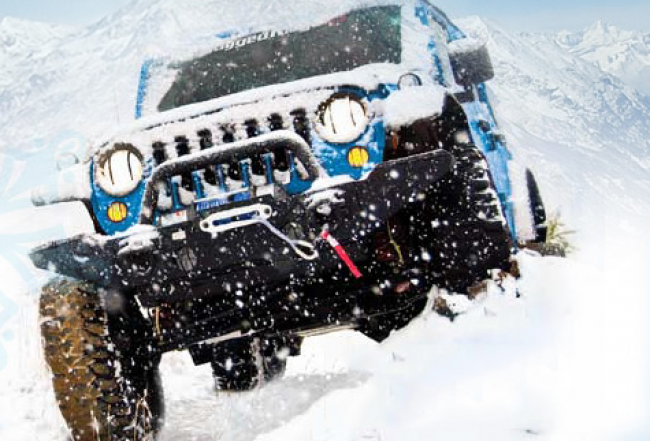 The time is now to put your Wrangler in 4wd high and low to test it out. The last thing you want is to be stuck in the snow because your 4wd is locked up. Your winter “tool box” isn’t complete without a set of chains. The key to winter driving is traction and a good set of chains provides it. SEMI truck drivers do this and you should take a lesson from them. These days’ chains aren’t as hard as they used to be. In some varieties it is as easy as laying them in front of your tires and then driving over them. This is incredibly handy when dealing with a very slippery road while trying to hook up chains. Whether your area normally gets an inch or several feet of snow, being proactive now about the winter weather will pay dividends. And remember to be safe out there! Next Entry Where will the Next Generation Jeep Wrangler be Built?